Sometimes you don't want to workout alone. Our group classes are a great option whether you're getting back into the gym, looking for some new exercises to mix up your routine or want to be pushed to your limit, we've got one to match your needs. And with your first class free, what's not to love? Want more info on our Kids Running class? Click here. The relaxed group training environment has also enabled me to get my teenage kids along to the 6.00am classes . Not easily done I can assure you. The ultimate in fitness training! This high intensity workout involves boxing bags, focus pads and speedballs. It also has a large abdominal component. Enjoy exercising with views of Perth and the Swan River. Includes cardio vascular, resistance, core strength and flexibility training. 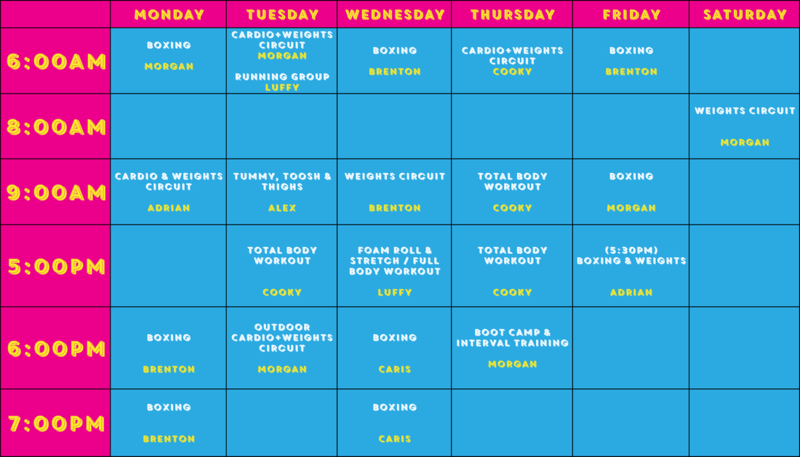 This is a specialised running class that our running coaches Cooky and Caris take every Monday and Tuesday. The class entails a mixture of interval, hill and long, steady runs. It also includes plenty of technique work together with core strength exercises. A comprehensive workout tailored specifically for women. Focusing on all the areas all you want to tone and strengthen: quads, hamstrings, glutes, calves, Inner thighs, upper abs, lower abs and obliques, and rounding off with a small cardiovascular component. Build your strength with our weights circuit. The name says it all! No muscle on your body is safe during this class, you'll be worked from head to toe. Made up of 50% cardio, 50% weights and core strength and ab work , you'll turbo charge your workout with this class. Our high-intensity full-body workout that'll push you to your limit. Combine the blood-pumping intensity of boxing with the strength-building of our weights circuit. Not too keen on high intensity workouts? Stretch & Roll is the perfect class for you - focus on extending your muscles and increasing flexibility. Want a workout that hits everything from head to toe? This high-intensity workout is the one for you. Let us know which one you would like to join today!